The KOO multi-jet nozzles are designed to be used, in air conditioning, ventilation and heating systems at a temperature differential up to 12°C. They can be mounted in the wall or the ceiling. The KOO multi-jet nozzles respond to different functional and architectural requirements thanks to their manually adjustable nozzles in all directions. 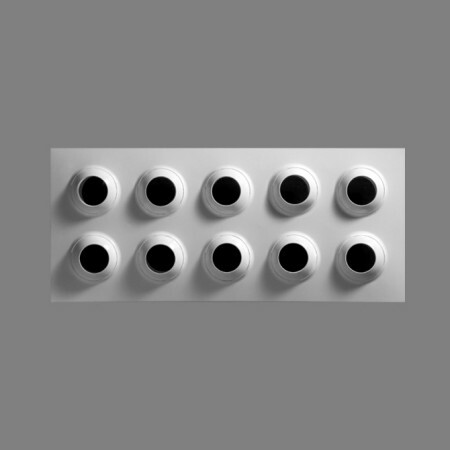 Depending of the size of the rectangular panel, the integrated nozzles can be from 80 or 125 mm. Thanks to its long throw and flexibility of direction of the air pattern, KOO multi-jet nozzles are suitable for air diffusion in all kinds of different architectures. It provides a high induction air rate level, reducing stratification. The KOO multi-jet nozzles represents a vanguard in design of air diffusers. Integrating the jet nozzles into the panel, the outcome is a smooth and homogeneous surface, reducing the visual impact within the interior architectures.